Making models of climate change is very difficult because there are many factors involved. When the Sun shines on the 70% of the Earth that is water , two factors will contribute to an accelerated rise in sea level. First, although the oceans have an enormous heat storage capacity, if global atmospheric temperatures rise, as they are, of course, doing, the oceans will absorb heat and expand, taking up more space. 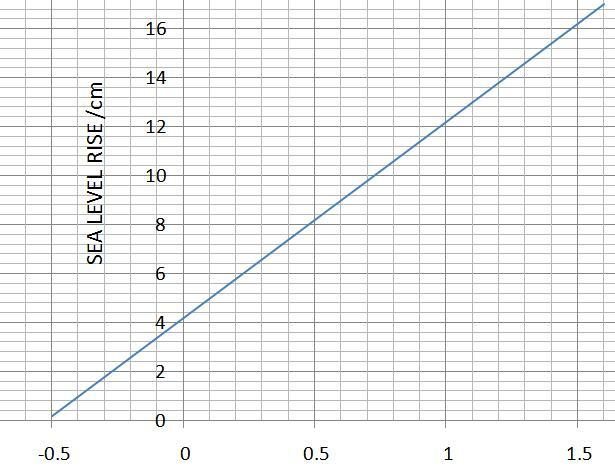 So, average ocean density decreases and a greater volume of ocean water due to thermal expansion will lead to a rise in sea level. Second, rising temperatures will cause the ice and snowfields to melt, thereby increasing the amount of water in the oceans. 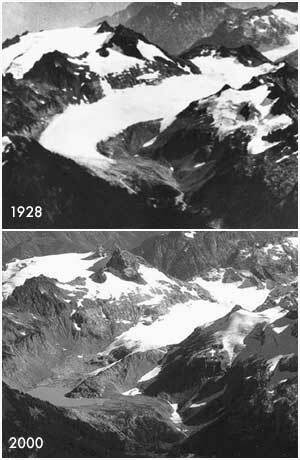 Only the melting of land-based ice and snow will increase sea level. The melting of floating ice doesn’t change sea level since the water is already present in the ocean body. A mole is an amount of stuff. In 2g of hydrogen gas – or 1 mole – there are 600000000000000000000000 [six times ten to the twenty-three] molecules of hydrogen the same number as in 18g of water – can you see why? Chemists don’t do big numbers – this is called the number of molecules in one mole, Avogadro’s Number. 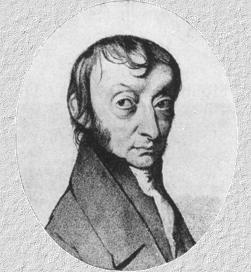 Avogadro was an Italian Count, with a doctorate in ecclesiastical law and an interest in science. In 1811, he published an article that clearly showed the difference between molecules and atoms. Bear in mind that people didn’t really know what they were talking about in terms of how chemistry worked back then. He suggested that the great English chemist John Dalton had got himself muddled up and he pointed out that “atoms” of nitrogen and oxygen are in reality “molecules” containing two atoms each. Thus two molecules of hydrogen can combine with one molecule of oxygen to produce two molecules of water. which is now known as Avogadro’s Principle. One mole of gas occupies 24 dm³ at standard temperature and pressure. An Avogadro’s number of soft drink cans would cover the surface of the earth to a depth of over 300km. If you had Avogadro’s number of unpopped popcorn kernels, and spread them across the United States of America, the country would be covered in popcorn to a depth of nearly ten miles. If we were able to count atoms at the rate of a million per second, it would take about 20 billion years to count the atoms in one mole – older than the age of the Universe. Put another way, only about 0.000000000000000014 moles worth of people watched Barack Obama’s swearing in as the 44th president of the USA, rather more than the 45th. Atoms can be deflected by magnetic fields – provided the atom is first turned into an ion. Electrically charged particles are affected by a magnetic field although electrically neutral ones aren’t. The atom is ionised by knocking one or more electrons off to give a positive ion. This is true even for things which you would normally expect to form negative ions (chlorine, for example) or never form ions at all (argon, for example). Mass spectrometers always work with positive ions. The ions are accelerated, then pass through crossed E and B fields which act as a velocity selector. Only ions having identical velocities can pass through a slit and into the magnetic field chamber. The amount of deflection also depends on the number of positive charges on the ion – in other words, on how many electrons were knocked off in the first stage. The more the ion is charged, the more it gets deflected. Here’s the maths – it’s not difficult. Temperature is the degree of hotness of a body. 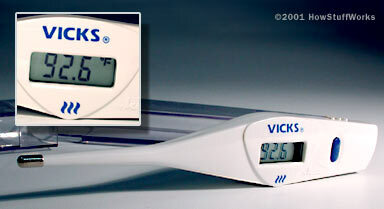 A thermometer tells us how hot by assigning a number to a temperature based on fixed points. Rather more formally and necessary to know if you’re doing IB is that temperature is a measure of the average kinetic energy of the molecules of a body. We don’t use mercury thermometers much these days because mercury is highly toxic and can’t be gotten rid of easily since it’s almost as unreactive as gold. Also, it might cause a little problem if you bit the end off accidentally while taking your temperature. Instead, we use digital thermometers which use resistors – called thermistors – whose resistance changes with temperature. A little processor measures the change in resistance and converts it to a digital display for us. If temperatures change rapidly, we can’t use liquid-in-glass thermometers, they can’t respond quickly enough. 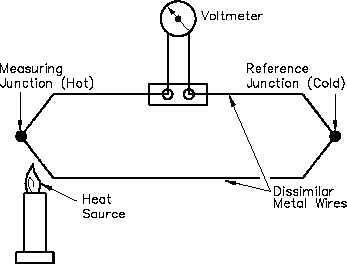 [exam question alert…] Instead we can use a thermocouple. A thermocouple is made from two dissimilar metals ( not the same), twisted together at both ends with a meter in the loop. If one end is hotter than the other a small voltage exists between the joined ends – this is called the Seebeck Effect. The bigger the temperature difference, the bigger the voltage measured by the voltmeter in the loop. We can calibrate the meter to read temperature. These things are very versatile. Dependent on the choice of metals, they can measure rapid changes across very large ranges, also both high and low temperatures can be measured. On average, the molecules in a glass of water do not have enough heat energy to escape from the liquid, or else the liquid would turn into vapour quickly. When the molecules collide, they randomly bump into each other and transfer energy to each other in varying degrees, based on how they collide. Sometimes the transfer is so one-sided for a molecule near the surface that it ends up with enough energy to escape from the attractive pull of the liquid. If the faster molecules escape, the slower, cooler ones are left behind. 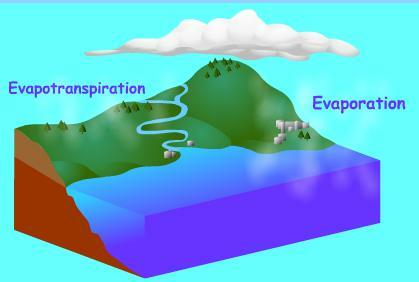 Evaporation (sweating) causes cooling. Boiling is forced evaporation and happens ONLY at one temperature. 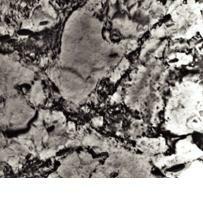 As we discussed in class, go to this site for an overview of bonding, including metallic bonding. We’re reminded that metals exist in a regular crystalline lattice, hence are shiny, densely packed with up to 12 nearest neighbours or touching atoms. Fullerenes are a range of newly found forms of carbon including carbon 60, a roundish molecule made of 60 carbon atoms If you imagine a flat sheet of graphite made round, that’s about it. It was named a fullerene or buckyball after Buckminster Fuller who invented the geodesic dome which has a similar structure. 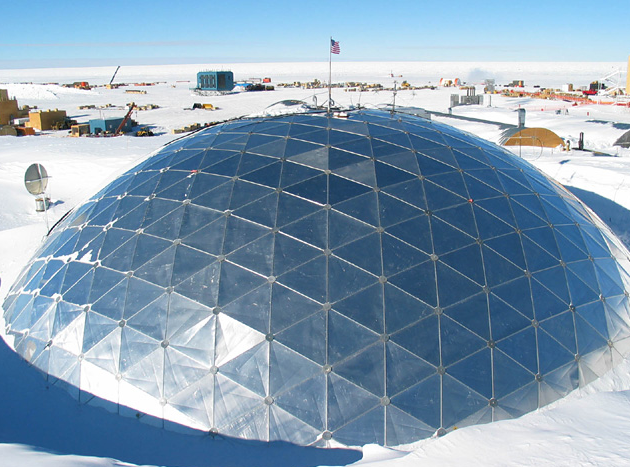 This picture is of one in Antarctica – the structure can be made any size you like from a tent to a stadium. Back to fullerenes – how are the carbon atoms arranged? The atoms of a C60 molecule are arranged in a shape that is exactly the same as a football. The formal name for this shape is a truncated icosahedron. It has 32 faces, of which 20 are regular hexagons and 12 are regular pentagons. These faces come together at 60 points, or vertices. In a fullerene, there is a carbon atom at each of these vertices. The truncated icosahedron is one of 13 Archimedean solids which you might have come across in Maths. Have a go at making one, if you like.. Look here, download the pdf files and try to make one. What are fullerenes, or ‘buckyballs’ used for? The answer is more and more useful things like incorporation into armour plating, because they’re so strong, also they are making quite a stir in the medical world too. Their ability to trap gases such as helium and store them, makes them suitable candidates for chemical and biological sponges. For example, when the brain is injured it releases deadly nerve toxins, which can have devastating effects on the brain. Doctors could use them as sponges to soak up all the harmful chemicals surrounding the brain. Then the chemicals would harmlessly pass through the body, without damaging any organs. Researchers have found that buckyballs are a close fit on the site to block HIV molecules. Put another way way, they have found they can stop HIV activity by “plugging in” a buckyball.. The molecule also can be tubelike. Buckytubes have been found to be a possible replacement for any narrow “tube-like” part of the body – veins, neurons, muscle, which is very exciting for medical research. NEW! The 2010 Nobel Prize for Physics has been won by Russian-born Geim and Novoselov, both now working at Manchester University in the UK for groundbreaking work on the monolayered allotrope of carbon called graphene. It’s like graphite but a single atom thick so it looks like a flat honeycomb with amazing possibilities for electronics since it’s a fabulously good conductor and might one day be used instead of silicon chips in computers which generate a lot of heat.